Released for PlayStation 3 and Xbox 360 in October 2012, Zone of the Enders: The 2nd Runner HD is the High Definition edition of the sequel to the underappreciated, mecha-infested Hideo Kojima third-person wreck-em-up. The player controls Jehuty, a highly defined mech through highly defined encounters with other mechs to progress through the highly defined plot reminiscent of animes. High definition animes. Sub 1 hour has finally been achieved! Shout-outs to Zeno for the original ZoE2 Any% segmented run, Uduki for help with comparing the JP-NTSC version to the NA one and general strat optimization, and DingoEgret56 for making Inhert a non-factor with his strat contribution. Also to my many long time viewers and friends that have kept me going in accomplishing this goal, Kalabeth especially. So breakdown of changes and updates to the run are as follows. Between the 1:06:39 I submitted originally to now the new sub 1 hour run, a few interesting things popped up that needed to be addressed. First, yes it is possible to skip too many enemies and end up underlevelled for the second half of the game causing considerable time loss. The biggest factor of this showing up is when you fight phase 1 of Zakat. You will take off tiny hairs of his life and it ends up taking possibly 2 to 3 times longer than if you were one or two levels higher. Because of this I made it a point to kill as many things as possible in the canyon run before Nephtis while trying to not get delayed because of it. That area seems like the best place to pick up extra experience as the enemies are all grouped up in a slim corridor. Extra experience can also be acquired at the landmine path and at Lloyd's base. Second, the new Inhert strat shown to me by DingoEgret56 has made that boss fight's both phases a simple exercise in not dropping the combo. All you have to do is catch him with a phalanx shot to stun him then follow up with 3 melee attacks and another phalanx shot to reset the combo. Unfortunately, this strat only works on Inhert but the time saved due to it was substantial. A note for phase 2, to speed it up, you must break the initial lock on which will cause Inhert to skip his floating mine and missile phase and immediately come in to melee attack you which leaves him vulnerable to the said combo once again. Finally, the last big change was the battleship order. The fastest known way for this version now goes as follows. You immediately just start dashing over to ship 2, flying over ship 1's deck to make sure it aims its main cannon at you (this makes sure the cannon and core stay open and vulnerable to vector cannon). Once at ship 2, land on its rear area. The cannon and core should still be closed. Fire vector cannon at ship 3. Its cannon should be exposed. Afterwards, ship 2 will start to open while ship 1 is still open from before. Turn and fire at ship 1, making sure you see the energy/subenergy acquisition to confirm the ship is destroyed, immediately start sweeping the vector cannon shot toward ship 2's core and you should be able to kill both with one shot. Fly to ship 4, destroy its front side armaments, the main cannon, and any enemies on you as you normally would, but before destroying it, turn and shoot ship 5 first as its cannon should be open and vulnerable as well. Afterwards, finish ship 4 off and that is that. One last fight that received a minor tweak in strategy is the com-space Anubis fight. In phase 2 and 3, you can bait his melee attacks so that the moment he tries for them you float in with a charged burst slash and hit him before he can open up with his melee attacks. 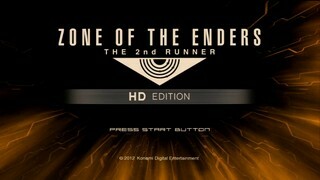 So that pretty much covers the journey to Sub 1 hour Zone of the Enders: The 2nd Runner Any%! Thanks to everyone at SDA that helped get this run published and hope you all enjoy the run!